A map of Rwanda highlighting Gishwati Forest National Park. Image via Google Maps. 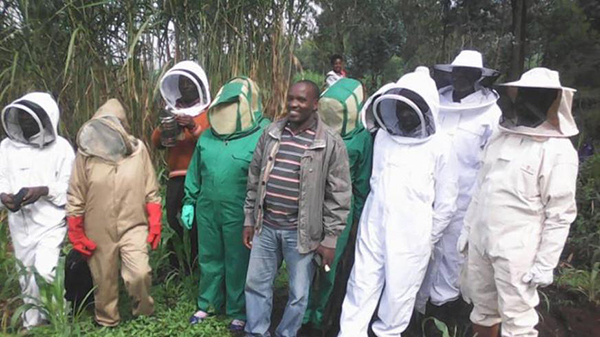 There's good news buzzing out of Rwanda's Nyabihu District for bees, farmers and forest alike! Read the full story from The New Times or take a look at the highlights below. Farmers in Rwanda's Nyabihu district were "poaching" honey by setting up traditional hives inside the Gishwati Forest for wild bees to inhabit. Not only was this dangerous for the farmers, but this activity resulted in damage to the forest when keepers would use smoke during honey extraction and inadvertently start fires. Members of the Nyabihu Beekeeping Cooperative Union. Image by Michel Nkurunziza via The New Times. 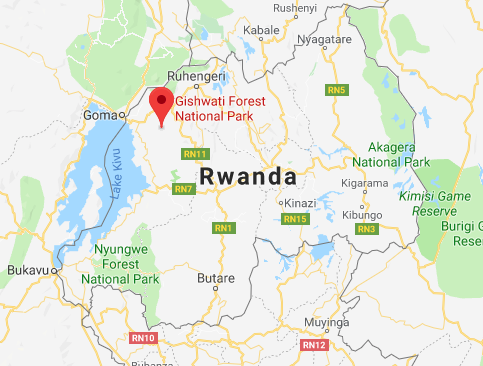 To solve these issues for all parties involved (farmers, forest, and bees), the Rwandan government dedicated 6 billion Rwandan francs (approximately 6.7 million U.S dollars) to restoring and conserving the Gishwati Forest and its buffer zone. Additionally, 1.7 billion RWF of this fund was set aside to create and support projects that would help communities surrounding the forest so that residents could support themselves without illegally hunting or poaching in the protected areas. 356 beekeepers who were once reduced to poaching honey for minimal profit,joined together to form the Nyabihu Beekeeping cooperative Union (NBCU). We partner with small-scale farmers to give them the tools and knowledge to earn a sustainable living while caring for the Earth. Like the members of the Niyabihu Beekeepers Cooperative Union, we encourage producers to form groups, pool resources and work together for a stronger future. Read more sweet stories of beekeeping success here and here. Through the guidance of environment law officers, these beekeepers now install their hives in the forest's buffer zone instead of the protected area of the forest. Members of the NBCU have received training on improved methods of keeping bees and now harvest three tons of honey a year. Through the NBCU, over 1,500 households are earning a living through honey sales and production. According to project coordinators involved in restoring the Gishwati Mukura Forest, at least 10,180 households have benefitted from community projects around the park.